Evening snacks are very important for me especially for my kids,kids will always come back home after a long busy day at school obviously they will expect to have something filling and satisfying as evening snacks.Evening snacks are more challenging than main dishes for me, usually i'll try to give healthy and hassle free evening snacks but sometime i do go for fatty evening snacks depending upon my mood and the ingredients available in fridge. One of my recent trial is this just 2 ingredients evening snacks. 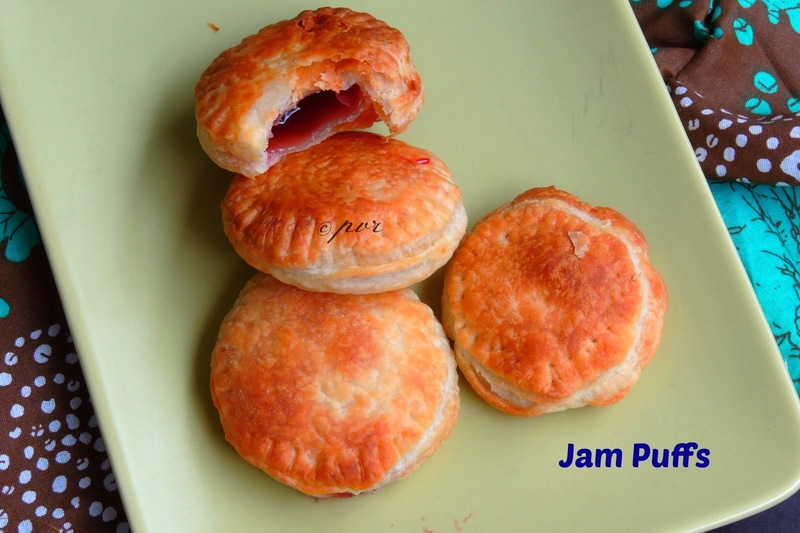 Yes this Jam puffs goes for store bought puff pastry sheet and few teaspoons of strawberry jam. Once baked,you will get some flaky,fruity,jammy puffs to enjoy with your cup of coffee or tea or else simply with some warm milk. Puffs, this flaky snacks goes obviously for puff pastry sheet which is easily available here and i'll always stock them in my fridge as they are handy and very useful to make many evening snacks out of it.Coming to this jam puffs, they are just prefect for an evening snacks which gets ready easily,trust these jammy puffs are seriously very addictive and kids will go crazy if they saw this flaky puffs. I prepared this puffs just with strawberry jam, but still you can replace it simply with different jams or else with nutella.Check out the Blogging Marathon page for the other Blogging Marathoners doing BM#40. Line a baking sheet over a baking tray, preheat the oven to 350F. Cut the puff pastry sheet with a round cookie cutter to get medium sized round discs. Drop a teaspoon of jam in the center, cover it with an another puff sheet disc. Press it with a fork. Transfer them to the already prepared baking sheet. Bake for 15-20minutes,until the crust turns golden brown. Remove the baking tray from the oven, let the puffs gets cool completely. You make it sound so simple. .wish it was easy to get the pastry sheets here....the puffs look so tempting. 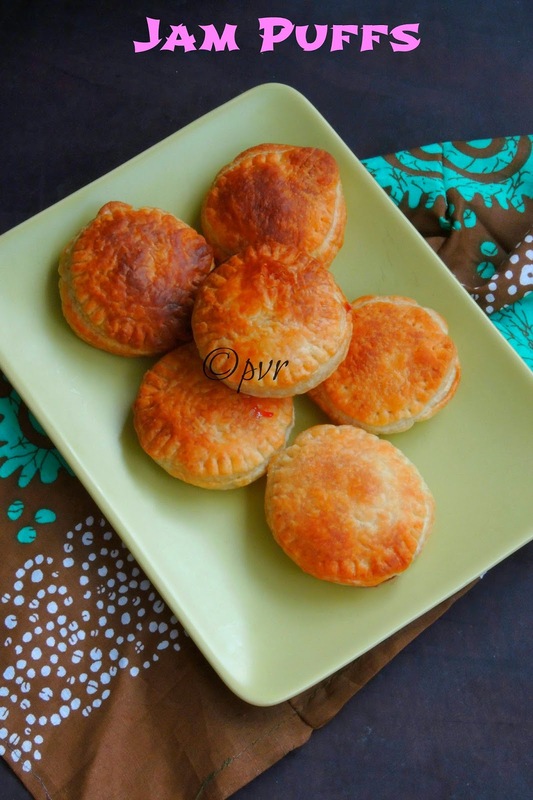 Wow Priya those puffs are surely look so addictive!..wish we get the puff pastry..I have so many bookmarked! WOW. Looks super delish..i want some now..
this is good idea thinking about snacks for kids should be highly paid job. Simply delicious and lovely looking preparation. That's so easy and looks yummy. I'm going to try this soon. a delicious and yummy snack, kids would love it! Simple. Easy. Beautiful! Can’t wait to try them!! These are so quick to make if you have ready made pastry sheets in hand. Well made Priya. Wow, this looks so good...wish we get pastry sheets so easily! What a quick and yummy kids snack ...Wow they look so soft.. This is such a lovely snack, both for kids and adults! wow super yummy Priya..and so simple with puff pastry too! God, looks too good, wish I got puff pastry sheets here..
Those jam puffs look so addictive and tempting. How do u come up with such innovative ideas...yumm !! I love jam snaacks...my current fav are jam biscuits and jam filled breakfast bars..
That's an interesting snack priya. Kids must love it. Yummy puffs.. They are so inviting & delicious. beautiful looking puffs!! loved the idea of jam as stuffing!! super easy and super duper delish. lovely color. These puffs are so cute! And super tasty too. very cute looking puffs and addictive too.